Making the trek home from our wonderful holiday in Italy and Greece, I was looking forward to our flight home. 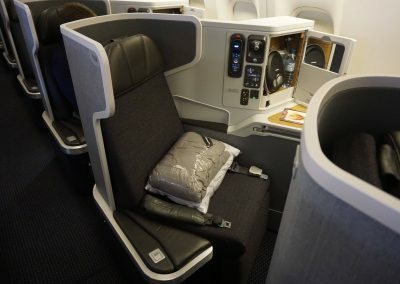 I love American’s 777-300ER Business Class seat. 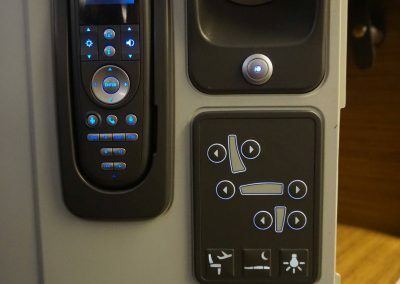 It is one of the best airline hard products out there right now. 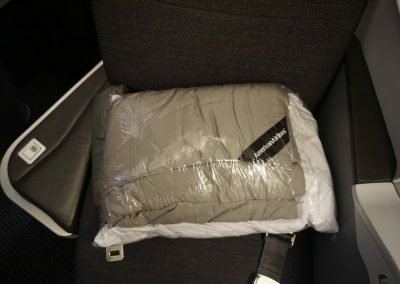 Soft product (customer service-wise) can be hit-or-miss on American Airlines unfortunately, so I try to moderate my expectations. I’m incredibly loyal to American Airlines but I have to be honest that it’s a realistic expectation. 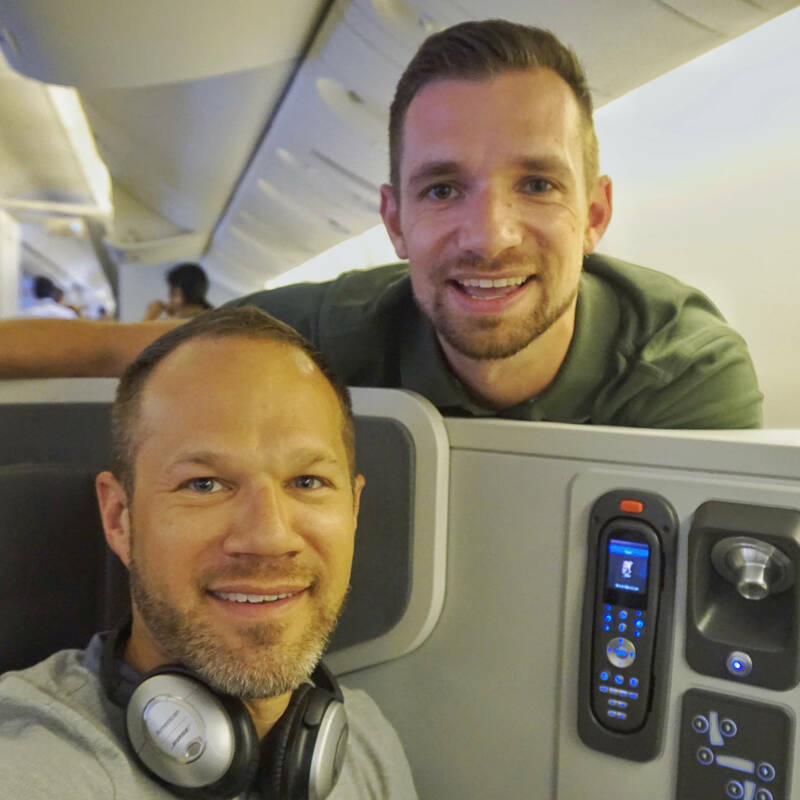 We had connected from our British Airways flight from Rome which arrived at Terminal 5. After the bus connection over to Terminal 3, where American Airlines’ flights depart, we stopped by the American Airlines connections desk. This is standard protocol for U.S bound passengers so they can ask you some security questions and issue boarding passes if needed. If you don’t stop by the connections desk, they will screen you at the boarding gate. After that, we spent some time at the Galleries First Lounge, rather than the Admirals Club. Terminal 3 isn’t my favorite terminal as it’s a bit sparse except for the duty free and shopping chaos near the center of the terminal. I have spent time in the Business Galleries Lounge in Terminal 3 but this was my first time in the Galleries First Lounge at Terminal 3. We didn’t have a lot of time in the lounge before our it was time to head to our boarding gate. We headed the standard “boarding pen” as I like to affectionately call boarding gates in Europe. 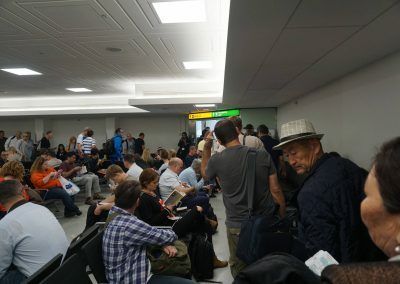 The flight was expected to be quite full so the boarding area was quite busy. There was an extra security protocol in effect so a lot of passengers went through additional screening at the gate. After a 15 minute wait, boarding began and we boarded with the Business Class group. 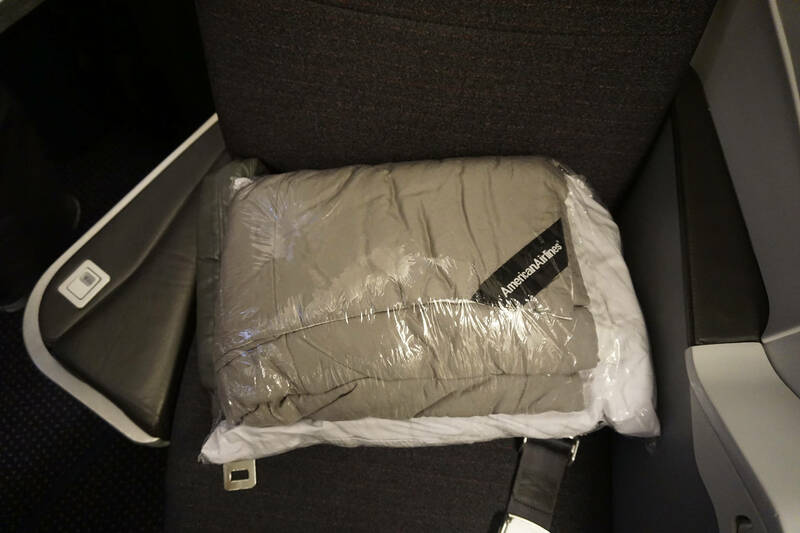 If you want to have and easy chat with your companion during your flight, the middle section with two seats is best. But Chris and I both like window seats so we are happy no sitting side by side. There is direct aisle access for all seats in Business Class due to the 1-2-1 configuration. 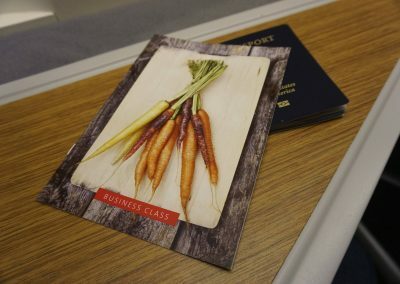 There are two business class cabin sections, one just behind First Class and then larger Business Class cabin just after the galley. 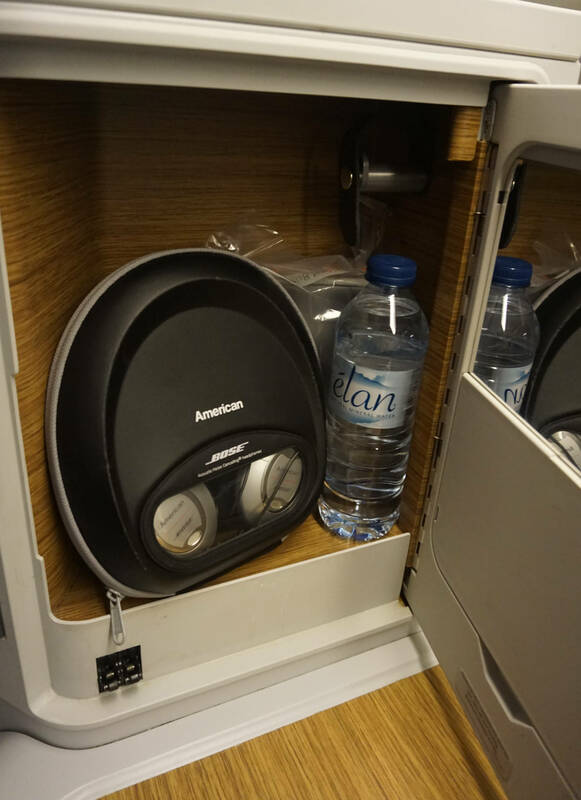 Many folks comment the smaller front cabin is louder due to the proximity to the galley. We took our seats in the main Business Class section, in seats 10A and 11A. 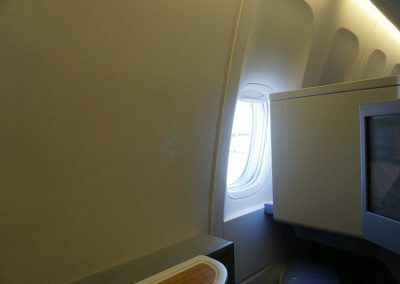 Beware that Seat 11A does not have it’s own window. I wished I had checked this before selecting seats. 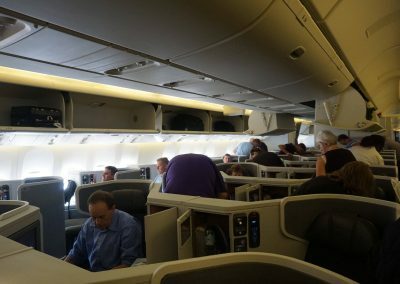 We got settled into our seats and I got some quick photos of the cabin and the seat. 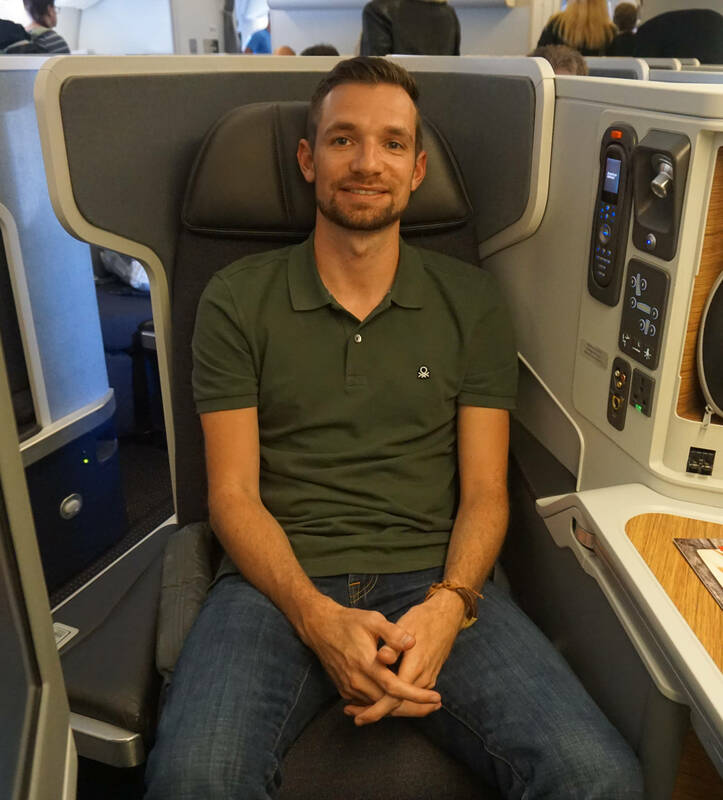 I had flown aboard American’s 777-300ER in Business Class back in May but this particular plane was a bit more well maintained than the previous one. There was a bit of wear and tear on that previous plane, noticeable for the plane’s young age. 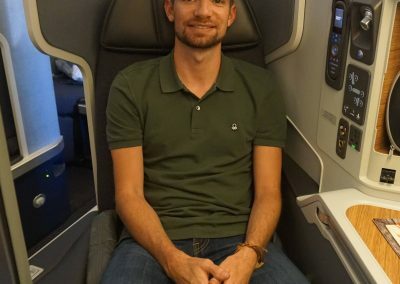 I am absolutely a fan of American’s Business Class seat on the 777-300ER and I know I’m not alone in that opinion. It offers lots of privacy, a true lie-flat bed, direct aisle access, and lots of storage. 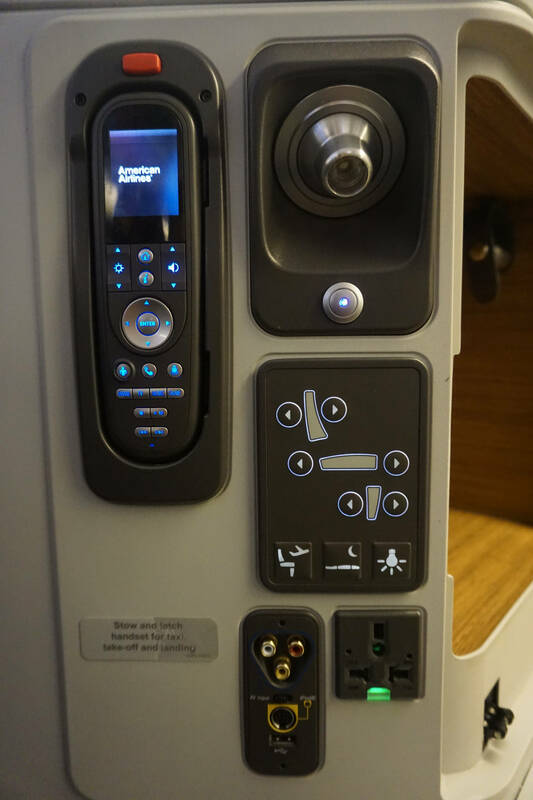 It’s a really comfortable seat overall with both AC and USB power outlets. 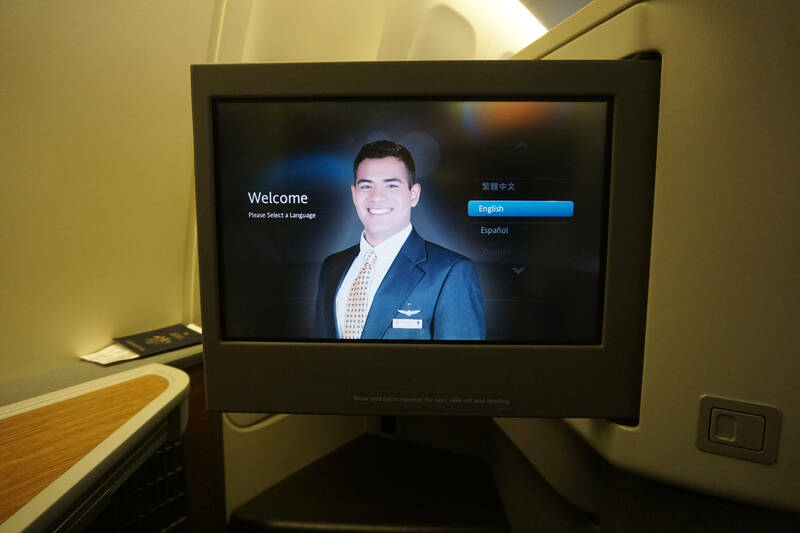 The IFE is about average but honestly I don’t usually interact a ton with IFE on a lot of flights. It gets the job done but my only minor dislike is the high amount of glare on the screen during daytime flights. 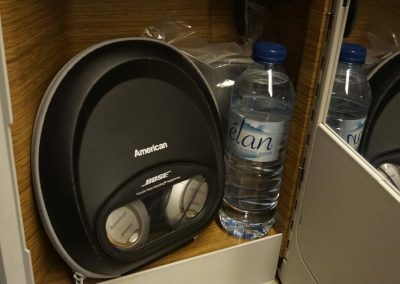 Also at our seats was bottled water, Bose headphones, and a Cole Haan amenity kit; stocked with some nice C.O. Bigelow toiletries and your basics like socks, ear plugs and eye mask. 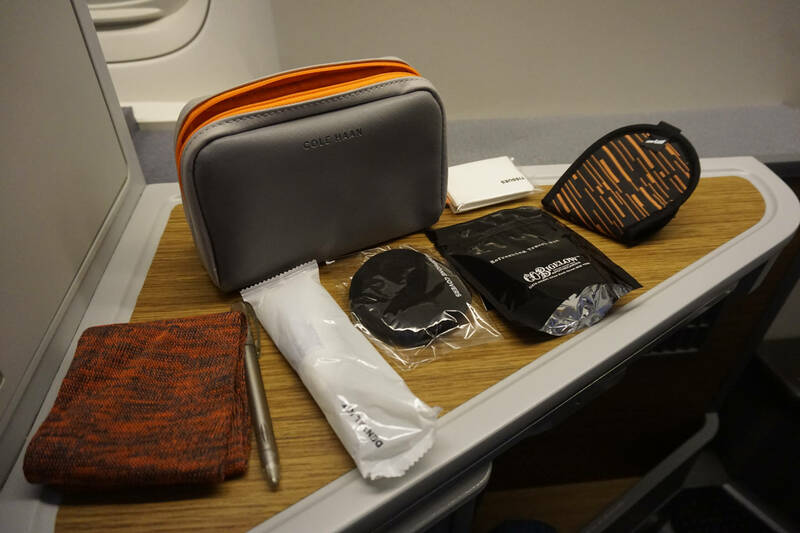 I really like the current Cole Haan amenity kits as they are very reusable and well made. 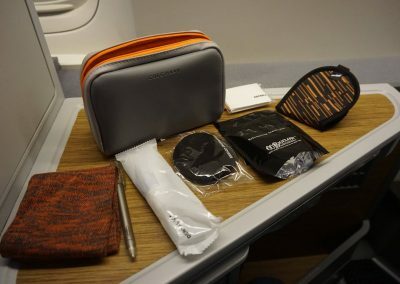 I already had the black and red version but this time I receive the grey and orange amenity version. Shortly after boarding, our flight attendant introduced herself and offered pre-departure beverages of orange juice or champagne. She was very friendly towards us but she sure was spunky. Overall I really enjoyed her but she didn’t put up with any rude passengers. She was happy to bite right back at them. We were on the ground a little longer than expected so she went ahead and took lunch orders on the ground. 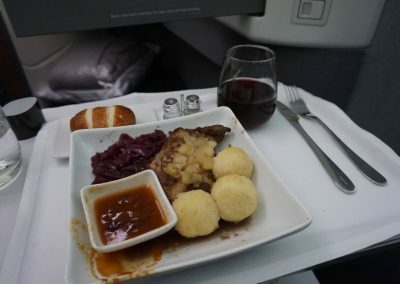 I had pre-ordered the duck breast for lunch in advance of departure. We had a very long taxi on the runway at Heathrow but soon we were in the air. Table cloths were brought out shortly after cruising altitude was reached along with hot hand towels. 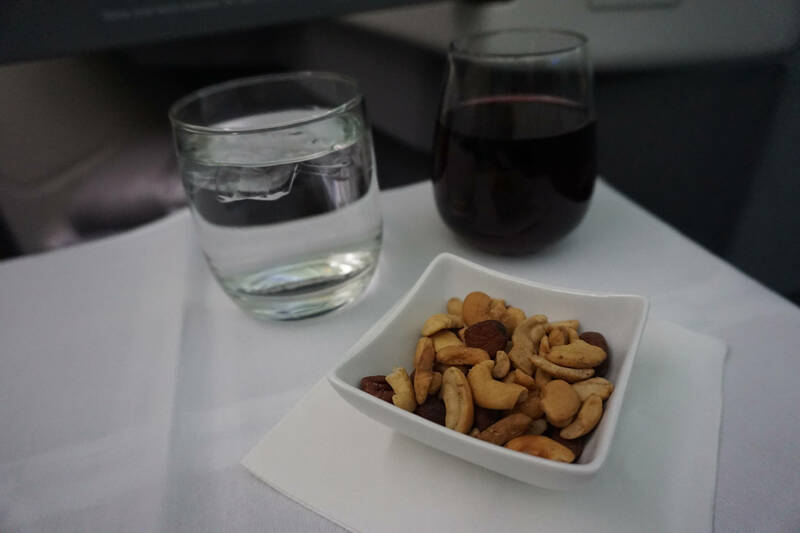 Wine and warmed nuts came out first. Shortly after, the starter came out which included a wedge salad and a Mediterranean assortment with feta, tabbouleh, hummus, and eggplant. The starter was chilled and I thought it was quite good. I don’t get excited about romaine lettuce so I picked over that. Moving onto the main course, it was duck breast with apples, potatoes, apple, and cabbage. There was a sauce on the side. The duck was really tough and challenging to eat. As you can see in the photo, the presentation of the entree was quite poor. 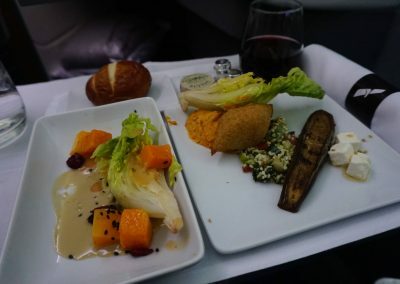 Overall it was an average in-flight entree. 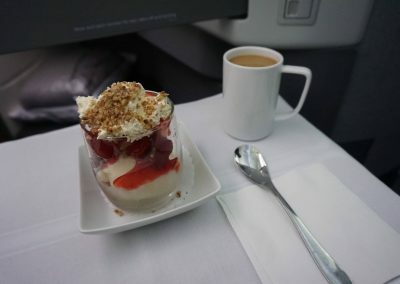 And finally in classic American Airlines fashion, came the ice cream sundae. The sundaes are always so good and one of the most consistent things in America’s premium cabins. After all this, it was time to spend some time catching up on some work and watch a tad bit of a movie. I got a bit of work done thanks to the board WiFi. 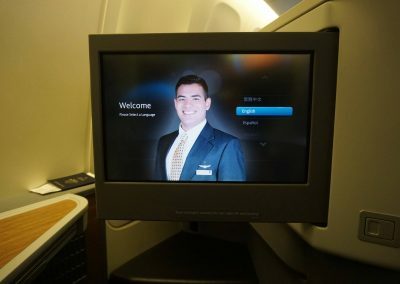 American Airlines Panasonic WiFi is consistently good and very reasonably priced at only $18 USD for the entire flight. Speeds were fairly good for an in-flight product and the connection stayed connected fairly consistently. 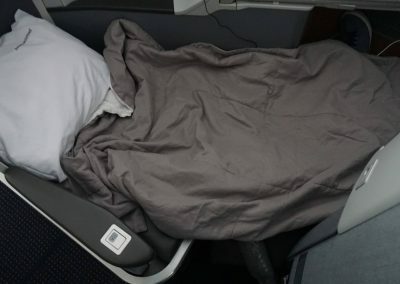 With about 4 hours out of Chicago, I decided to convert my seat to a bed a catch a bit of a nap. Being up since 4:30 AM in Rome was starting to get to my energy levels. I pulled out the full-sized pillow and duvet which are super soft. I curled up and quickly dozed off. For my 5’10” height, there is more than enough room to spread out and lay down. 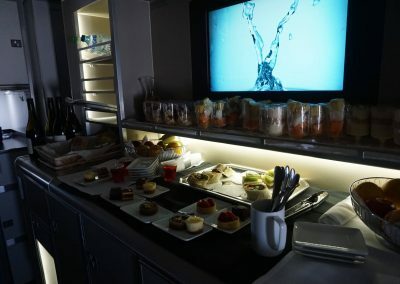 Throughout the flight, there were a variety of snacks available in the galley between the two Business Class cabins. 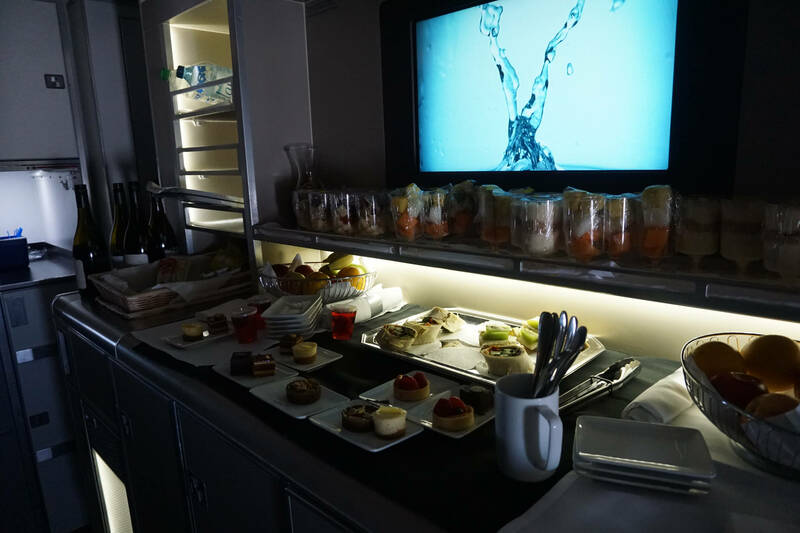 Snacks included chips, fruit, small desserts, and sandwiches and bottled water. 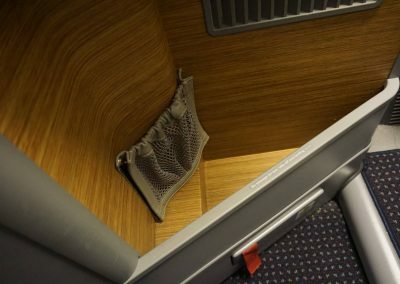 There are two lavatories between the two business class cabins. The right hand side lavatory is the much larger, handicap-accessible lavatory but both lavatories were clean and stocked with decent soaps and lotions. 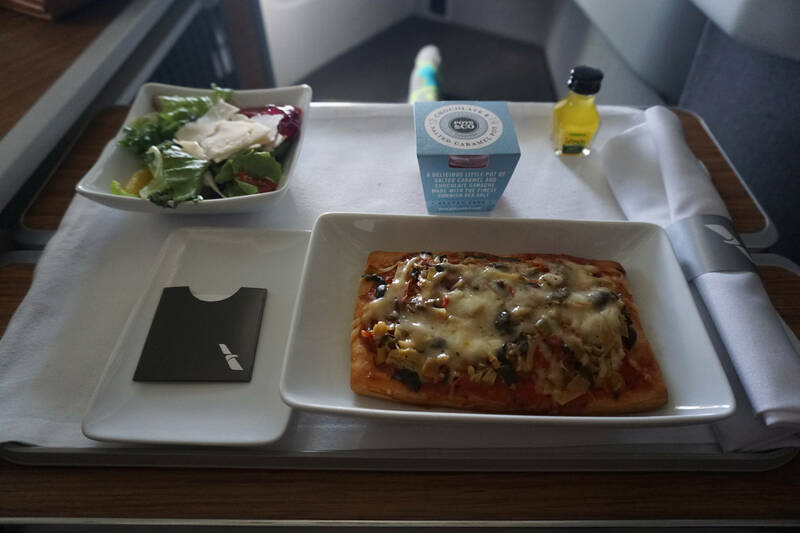 About 90 minutes from arrival in Chicago, our pre-landing meal service began which was a light lunch service. 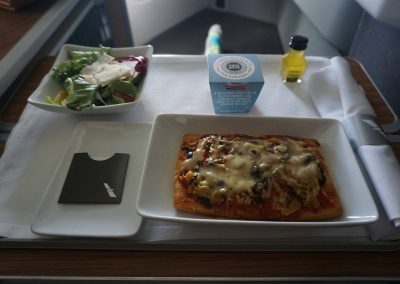 I opted for the vegetarian flat bread which was essentially a boring pizza served with a side salad and small chocolate dessert. It wasn’t terrible, just nothing exciting about it. 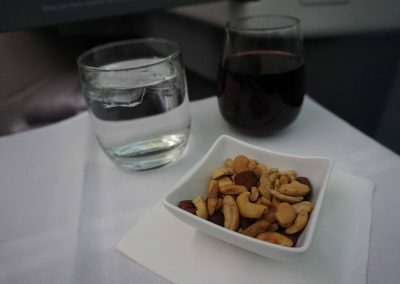 About 30 minutes before landing, all glassware and dishes were collected as well as the Bose noise-cancelling headphones. I didn’t use my Bose headphones much on this flight except while I slept. 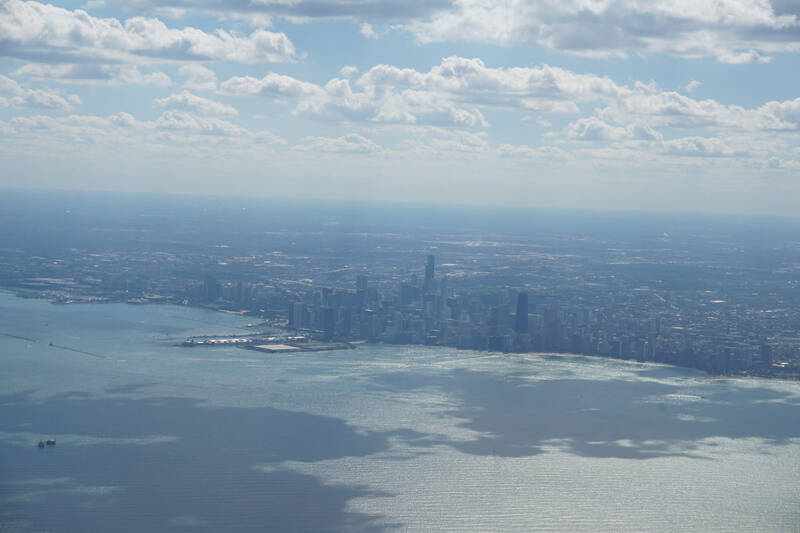 As we approached Chicago, the skyline and Lake Michigan came into view. I always enjoy the approach into Chiago as it offers some great skyline views of the city. On the contrary, I do not care much for Chicago O’Hare as an airport. It’s very dated, congested, and crowded. 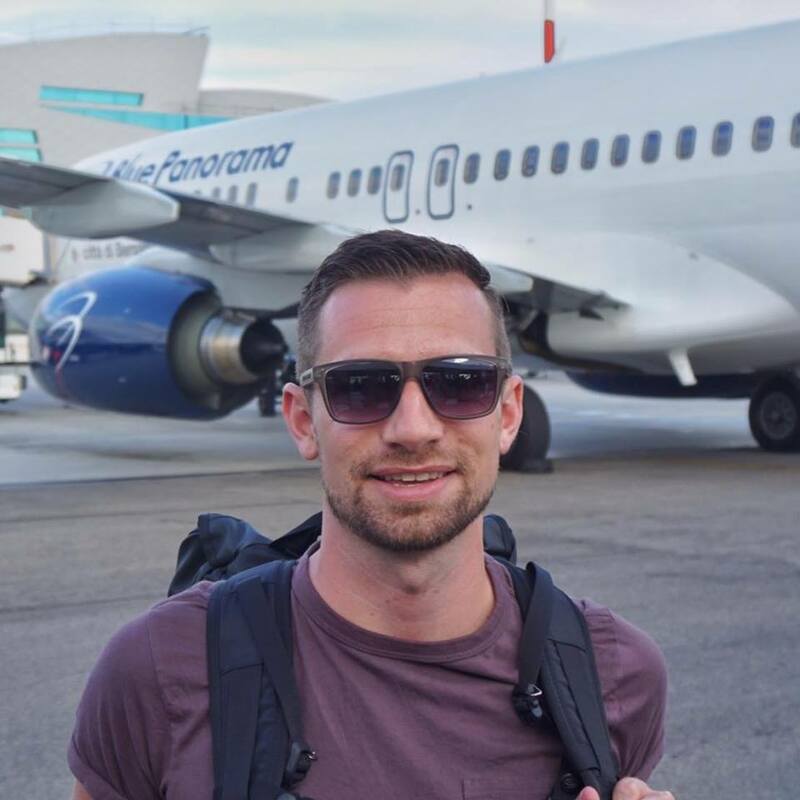 Once on the ground, we had a surprisingly short taxi to the gate. We were able to deplane rather quick but for some reason, there were extra border agents on the jet bridge. Not sure if this was random or suspicious activity on our flight. All international arrivals (except pre-clearance flights) arrive at Terminal 5 at ORD. 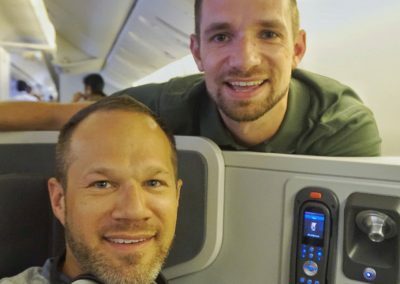 If you have a domestic connection, you will certainly have to switch terminals after clearing US customs and re-checking bags if you have checked luggage. 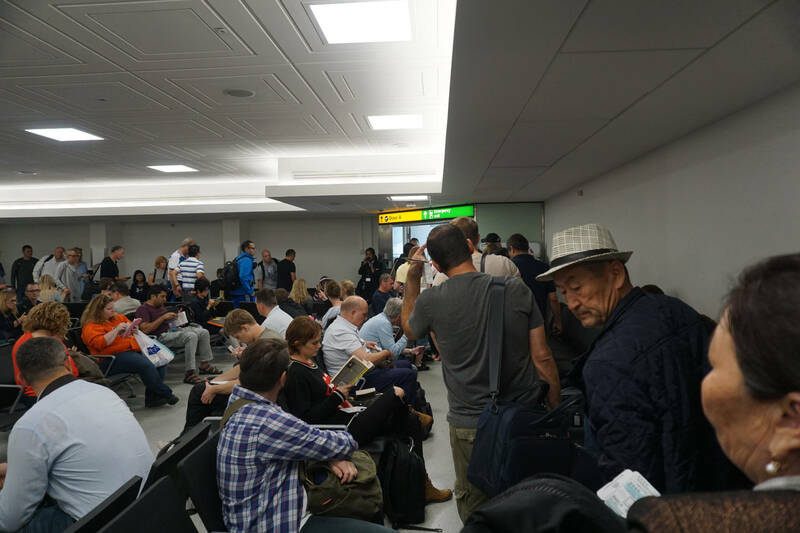 The lines for customs clearance, even for US citizens, were very long. Arriving in the late afternoon, this is to be expected with many international flights arriving at in a big wave. We were given Express Connection boarding pass sleeves at the jet bridge so we could get priority line access for customs and security. However, we have Global Entry so we were able to clear customs rather quickly. Paired with TSA PreCheck, we re-cleared secuirty in reasonable speed. 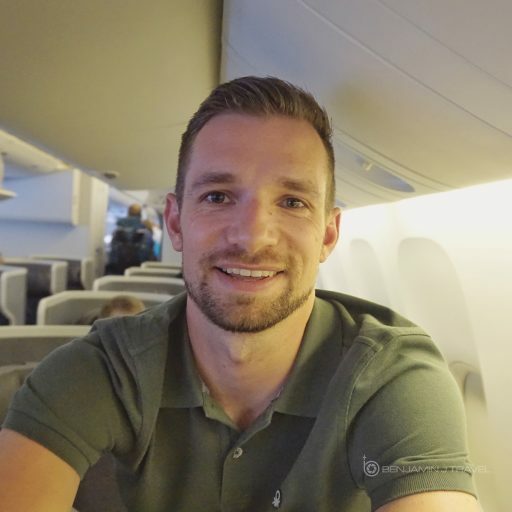 We were able to easily make our 90 minute connection for our onward flight to Dallas. All things added up, we had a nice flight with American Airlines in Business Class. 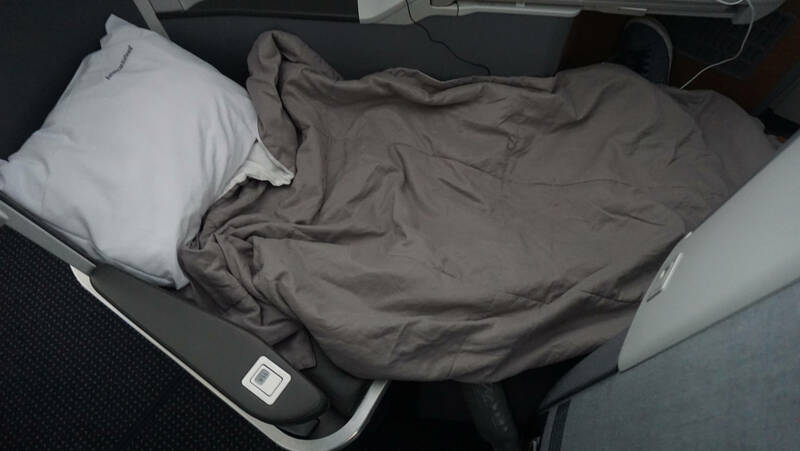 This was one of the better experiences I’ve had recently on an American long-haul flight but it wasn’t perfect. Some of the crew members on the other aisle definitely could use some customer service refinement. 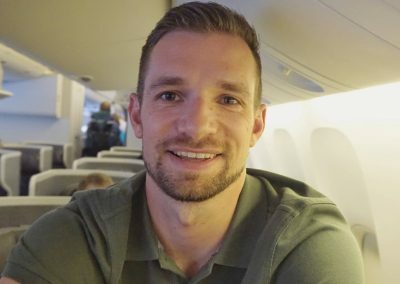 I was just pleased our aisle’s flight attendant was great. The seat was fantastic as always but the food was mixed, some good, some bland. I think I should have known better pre-ordering the duck breast entree! 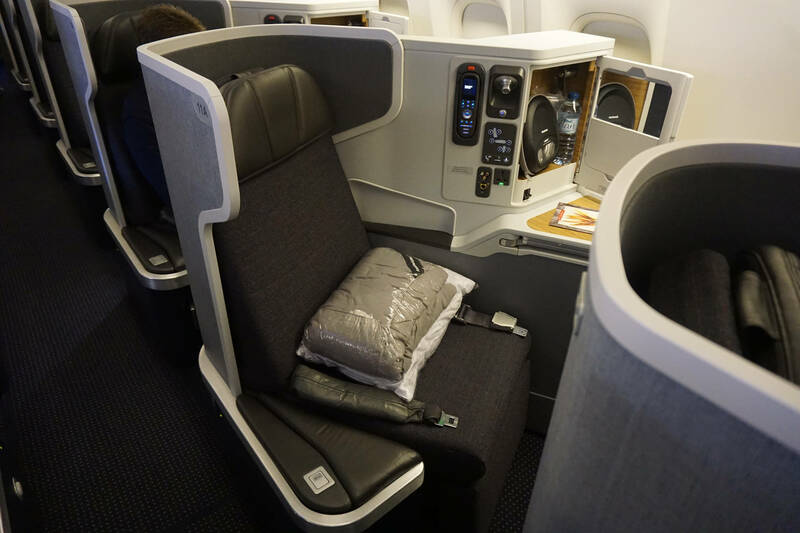 Have you flown aboard American’s 777-300ER Business Class recently? What did you think? How was your experience? Share below in the comments! > This is standard protocol for U.S bound passengers so they can ask you some security questions and issue boarding passes if needed. If you don’t stop by the connections desk, they will screen you at the boarding gate. Thanks! 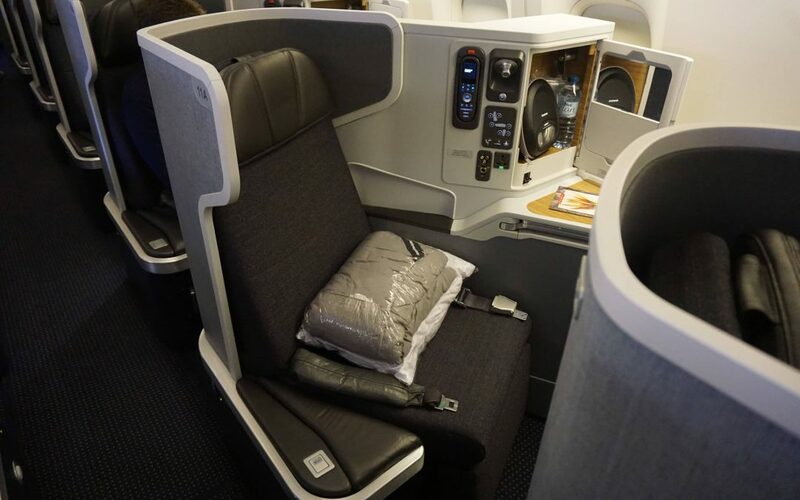 I’ll be on the upper deck on the BA 747-400 next month, looking forward to comparing! Which seat are you in? 62A/K or 64A/K are the best! 63 is marked as exit row. What are 62 and 64 like? 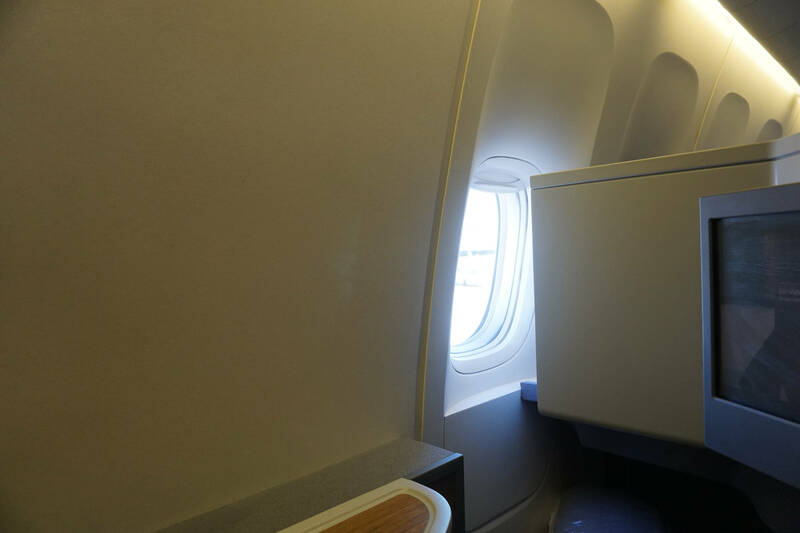 There’s an exit row between 62 and 63, so if you’re in 62 A/K, then you have direct aisle access and no one to jump over plus crew doesn’t need to lower the divider to serve you food. 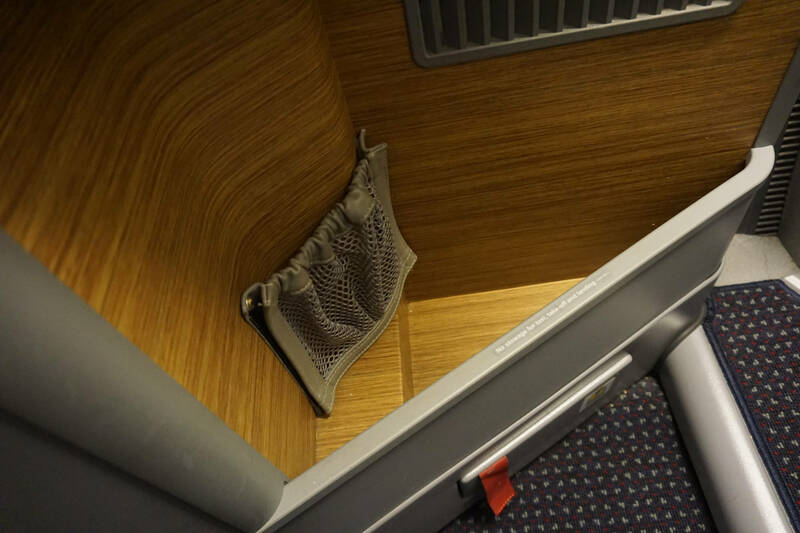 64 A/K are the best as they have extra space behind them, where you can fit your carry on or backpack (not during take off or landing!). 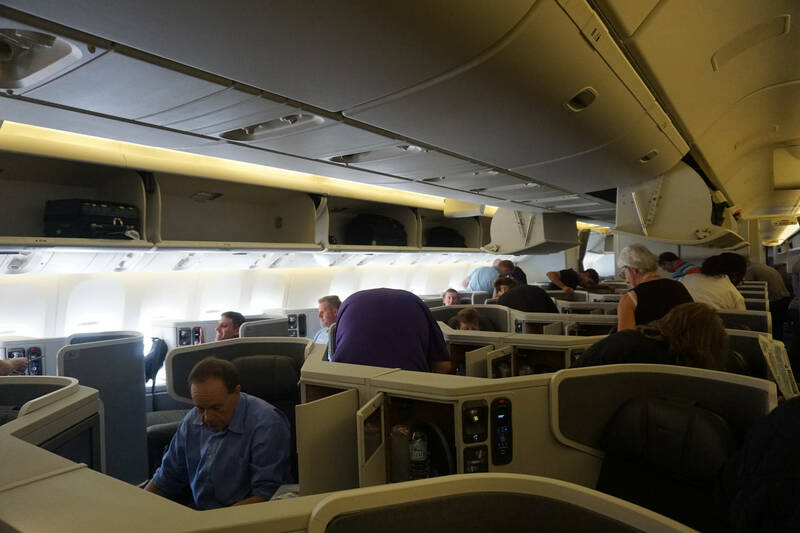 The upper deck feels a little bit like a private jet and usually gets the best cabin crew.